"Geno" is smaller in build and body, but big in heart and scope. 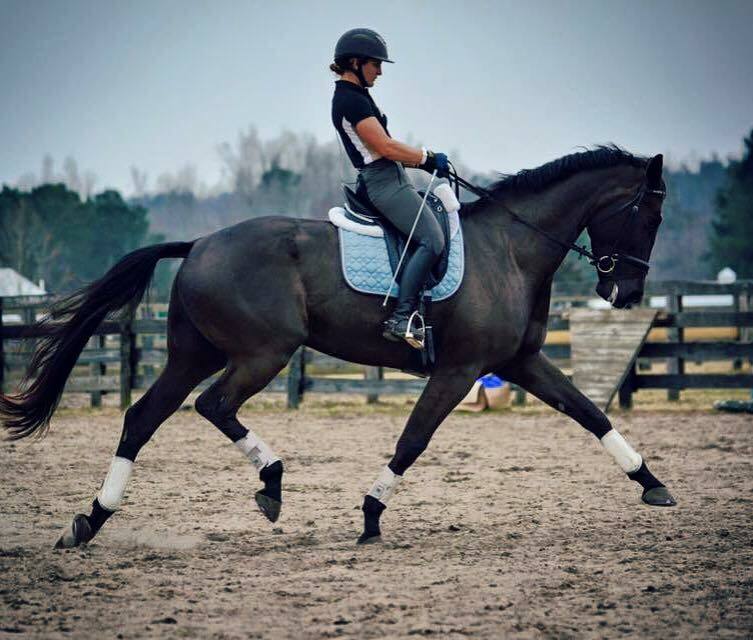 He is a hard working horse who thoroughly enjoys learning and practicing, especially the dressage. With his age, he still becomes frustrated with himself when he is confused, and hates to touch rails. He can give menacing looks from his stall, but we are convinced he just wants more love and scratches... and mints. So of course he gets them. "Lily" is the latest addition to our team, with high hopes for the future with her elegant movement and awesome scope. She excels on the flat, and loves floating around to land in the top of the pack after the dressage, then cleans up with great jump rounds. She is a very vocal girl, from snoring loudly in her stall when she naps, to grunting and groaning as shes tacked and brushed. Her favorite cookies are ALL OF THEM and she is quite fond of her stall neighbor Geno. Zara, often known as "Big Red Mare," is as strong, fiery and bold as she is beautiful. 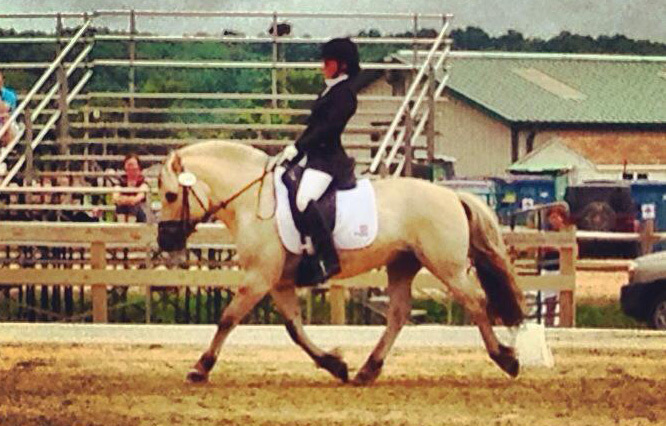 While dressage is not her favorite activity, as she matures she has become agreeable through the upper level tests. She excels at the jumping, although prefers I don't interfere with her haste. Her favorite treats are pears and bananas, and she noisily requests them with her feet as you try to tack her in the barn aisle. Zara is currently under contract to teach another rider how to tackle some massive jumps with no fear, and we can't wait to see how they go together! Tracey will probably always call "Zoomer" the best horse in the world, even if she's sitting on some fancy advanced horses. Zoomer has been with Tracey since he was a weanling. He was the first horse she ever broke and trained, he went preliminary by age 5, and brought many of Tracey's dreams true. He now brings the students dreams true by taking them to their first eventing outings safely, and earns as many treats as he can possibly eat. Skogen not only wins the cutest pony at the dressage show award, he also can blow some judges away with his good balance, even rhythm, and smooth flowing tests. He is not a horse that gets awarded great scores without the hard work -- impressing a warmblood-minded judge as a drafty pony is tough! 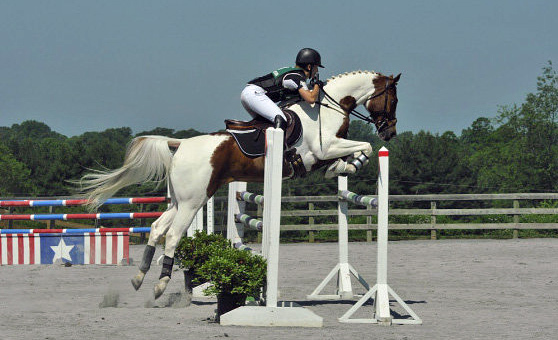 In addition to earning high awards for his breed in training and first levels with Tracey, he is also ridden by his owner who hopes to show him eventually also! 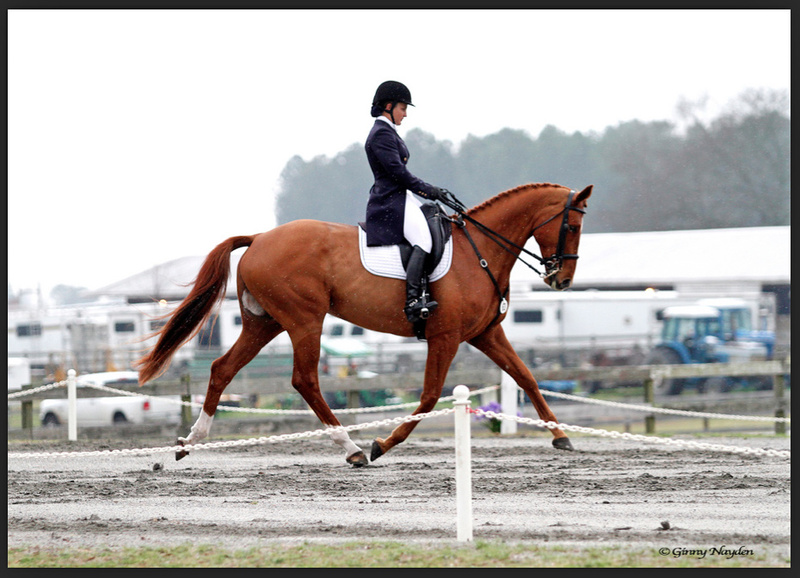 Austin is a lovely green horse who will be competing in his first recognized events this Spring. 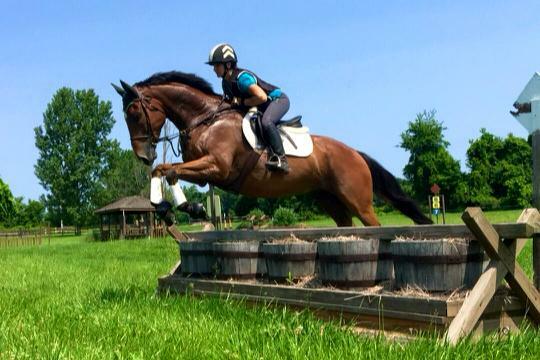 His owner, Allyson, purchased him just off the track and has enjoyed the thrill of developing her own young horse. Austin has his fair share of quirks, however, like the occasional happy dance when he is out jumping. 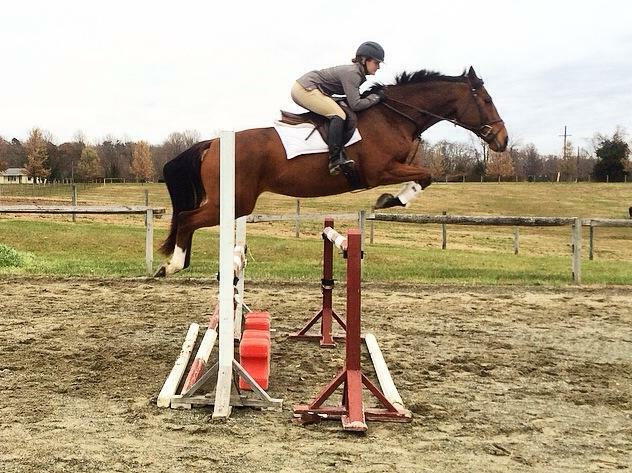 While Allyson gains confidence with lessons, Austin will be getting some extra experience so when she's ready for bigger jumps, he's already seen a few. "Reggie" is the favorite "puppy" in the barn - he thinks that people are his best friends, treat dispensers, and personal scratching post. 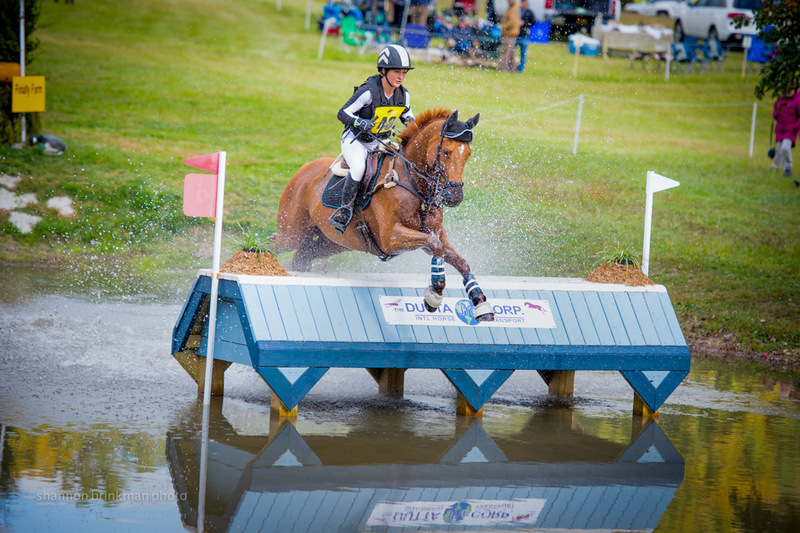 While he arrived quite green, he stepped up to the challenge and debuted in eventing in 2015 with good results. He also showed Tracey his true grit with some foxhunting, which he seems to enjoy much more than ring work. While he was green, and so was Tracey, he successfully clocked around with the front of the field in the Green Spring Hounds hunt, and the Wicomico hunt, in cubbing and regular season.